New and upgraded, the GMT-Halo is the shortest and lightest Halo so far, using an improved closer mechanism. The GMT-Halo can be used on the standard A2 birdcage style flash hider. Additionally, the KAC556 mount from Primary Weapon Systems can be used. The GMT-Halo is easy to use and requires no modification to the host weapon. It utilizes a simple, patented, no-tools mounting system that slips over most NATO weapon 5.56mm flash hiders. There is no need for proprietary mounts or modifications to the barrel. The GMT-Halo may be swapped between many different weapons easily, including the M16, M4, HK416, and M249. Mounting or removal can be performed without the use of tools in less than 30 seconds. 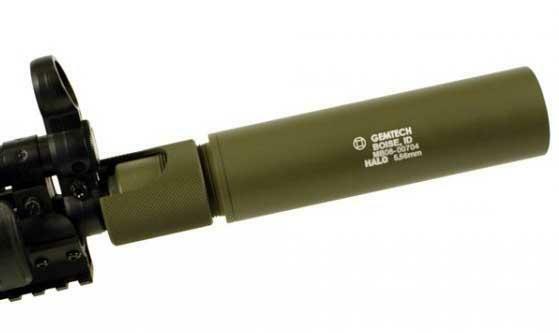 The GMT-Halo is rated for barrels 10.3" or longer and fits A1/A2 flash hiders and includes a shim kit.